Data integrity and accuracy are major concerns for businesses seeking to circumvent the devastating and often irreparable consequences of using corrupt, inaccurate, or incomplete data. Allied Infoline is your trusted partner when it comes to providing top tier data cleansing services for your business processes and applications, with a view to drive improved and desired outcomes. Equipped with extensive experience in data cleansing and management, we are ideally positioned to sanitize and optimize your database for all data-driven business initiatives and objectives. 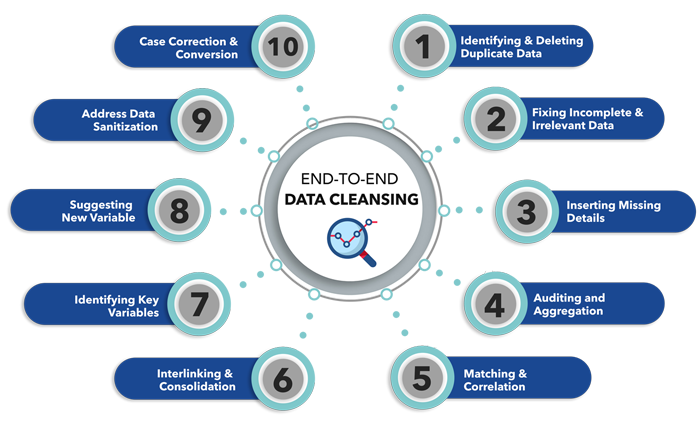 There are a lot of reasons why we are one of the best data cleansing companies to date. We offer customizable and scalable services, employ the latest in technology, communicate with you regularly while presenting deals that assure you the much-needed cost-efficiency. Above all, we thrive on maintaining data security and confidentiality and abide by norms pertaining to Data Quality Management. Consult Your Data Physician, Today! Allied Infoline handles the data cleaning needs of differently-sized clients from all industries. We are always ready to discuss your data scrubbing needs and carefully craft a customized solution. To learn more about our Data Cleansing services or discuss your requirement or fill out our contact form and we will take it from there. You can also write to us at sales@alliedinfoline.com.